In its pivot to English, the aviation industry is not unique: Around the world, companies and industries are recognizing the need for a lingua franca, or common language. We’ve published research that shows countries with higher English proficiency tend to be more innovative and have stronger economies . Corporate leaders, such as Rakuten CEO Hiroshi Mikitani, talk openly about the benefits of “Englishnization.” Tsedal Neeley, an associate professor of organizational behavior at Harvard Business School, has written about the benefits of setting English as the corporate language . She argues that businesses with strong English skills can buy from and sell to a more diverse range of customers and business partners. They also have better internal communication across geographically dispersed workforces. All of these benefits apply to industries as well. We published the results of this survey in the third edition of the EF English Proficiency Index for Companies . Our findings reveal some unexpected patterns across industries and countries and within companies — and they suggest opportunities for global companies to gain a competitive edge. On average, women have better English language skills than men in most countries, industries, and job functions . This skills gap might reflect an education gap: Women receive more years of formal education than men, are more likely to attend university, and are more likely to study the humanities. 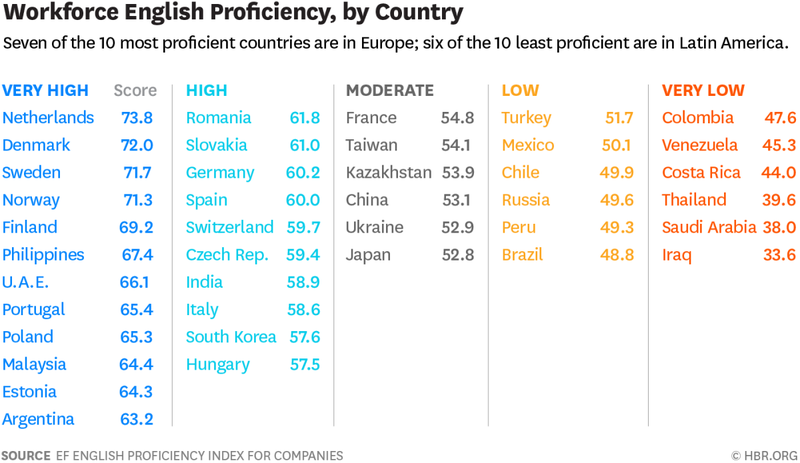 English proficiency in companies is low in most countries. Professionals speak at least some English in all of the countries surveyed. However, global workforce English levels are generally low, with an average score of 52.56 on our 100-point scale and national scores ranging from 73.83 in the Netherlands to 33.64 in Iraq. Not a single country surveyed has workforce English proficiency that qualifies as “advanced” — level C1 or C2 on the Common European Framework of Reference for Languages . Despite a near universal recognition of English as the international language of business, wide gaps in workforce English proficiency persist between countries.